Group interviews are often used when multiple positions are being filled at the same time, such as a new firm looking for several employees, or a large company who needs to hire a large block of employees. These interviews differ from individual interviews in many aspects, because in a group interview, you are asked to participate in group activities. The interviewer makes use of such activities for assessing how candidates interact with other group members and how they perform in a team environment. Although group interviews can be nerve-wracking, with a few good strategies and a bit of preparation, you can stand out from the competition and ace your group interview. 1.) Panel Interview: In this type of interview, a panel of 4-6 interviewers will ask face to face questions to a group of job seekers. Generally, panels include people from the firm with a variety of backgrounds, such as executives, team leaders, human resource managers, and employees that you will work with, if you’re hired. Your goal during a panel interview is to get your ideas and opinions heard without dominating the conversation. Thus, be respectful to the fact that the other candidates also want to voice their ideas and thoughts, and the panel wants to hear from everyone. Always make sure that your comments are memorable, respectful and intelligent. 2.) Project Interview: While panel interviews are more verbal, project interviews involve active participation of the interviewers and the candidates. In a project interview, job candidates are put in teams and required to demonstrate various skills such as project management, leadership, interpersonal communication and teamwork. Project interviews provide the best opportunity to flop or shine. It’s difficult to prepare yourself for this type of interview if you have no idea what the project, task, or activity will be. On the other hand, project interviews offer a platform to showcase your ability to interact effectively with others, your creativity, leadership skills, and team participation. 3.) Project/Panel Hybrid Group Interview: This is probably the most common type of group interview which is a hybrid of a panel and project based group interview. Candidates will start off with a discussion based panel interview. Break off into small groups to complete some sort of task. Return back to a panel interview to discuss the project. And then break off for one-on-one interviews with someone from the panel. Firms that recruit large numbers of staff love to conduct group interviews. Apple Computer, Google, Amazon, various banks, Yahoo, online retailers, Macys, etc. all use group job interviews to recruit staff. Many companies use group interviews to recruit recent college graduates into entry level positions. How do group interviews work? Generally, a group interview will last from 2-4 hours. However, sometimes they can stretch over many days and turn into a grueling interview. Group interviews are different from regular interviews as they have strict guidelines. This is because there are so many candidates in the process. You will hardly have any one-on-one time with your interviewers. Yet your performance will be constantly observed in the activities and the way you interact with the other candidates. Job interviews can be intimidating and stressful even under the best circumstances. Following is a brief overview of some useful strategies you can use to handle a group interview. 1.) How am I assessed in group interviews? Like all other interviews, your assessment starts from the moment you enter reception area. The interviewer will focus on everything from your clothes to your behavior. You can create a lasting impression during the initial stage of the interview. Your first chance to create a great impression is when you introduce yourself to the group and the panel. Speak in a clear voice. If you want the interviewer to know your greatest achievement, don’t say something that most other candidates have also achieved, such as finishing college with good grades. Instead speak about an issue that is important to you, as well as, being related to the requirements for the job. Everything you say is always stronger when you can tie it in to the job requirements. For example, if you are interviewing for an environmental company, you might mention that you were an active member of the local tree-planting club whose charter is the preservation of forests and the reduction of climate change. 2.) What is involved in speech, role-playing and group activities? Group activities are normally used for testing your problem-solving and teamwork skills. They all demand your cooperation within a team and this will give rise to some heated debates. Be genuine and get involved by saying what is in your mind. You can state your opposition if the group is heading towards a decision that you don’t agree with. Give a reason instead of just objecting. However, always remember to support the group by not being overly pushy. Role Playing: Role-playing is an unrehearsed test to see how you can perform under pressure. The major purpose of this test is to find out your natural flair and ability. In sales and retail positions, it’s very common to be asked to sell items to one of your fellow applicants or to the interviewer. You can prepare for this by role-playing with a friend. If you’re not good at role-playing, then you’ll want to work harder on this weakness before the interview. The interviewer may ask you to give a short speech to describe the reasons you deserve the job. Don’t just regurgitate your resume. This is your chance to cover anything you haven’t discussed so far, and to say more about yourself. Make sure to stand out by interacting with the interviewer, whether it’s with your winning smile or something else like your humor. You don’t need to be the greatest public speaker in the room, however, by having a relaxed facial expression, standing tall and confident and managing the tone of your voice will help a lot. 3.) What about general knowledge tests? The interview procedure is always different every time. There might be a psychometric or mathematical test. It is not easy to prepare for such tasks, although you can use psychometric tests on the Internet to practice. A useful strategy is to ask about the tests before you go on the interview. The interviewer might ask you to answer some questions related to your industry, so make sure to research the main aspects of your industry. Don’t rely on doing a quick Internet search or browsing the company’s website. If there is conflicting information or if you’re having difficulty, don’t hesitate to call the company’s representative to get the answer. Performing well in a group interview is a fine balance between looking bossy and showing creative individuality. It is essential for you to find the balance between listening to others and vocally steering the ideas of your group. Developing a strong rapport with your interviewers and colleagues is the best way to ensure a successful candidacy. The easiest way to develop rapport is through your intelligence and confidence. All throughout the interview, it’s essential that you smile, listen, maintain good eye contact, and you’ll make a lasting impression. It’s possible that your interview will be formal, with a prepared set of questions. Or it could be just a conversation between all the candidates in the room. Most of the interviews are in between these extremes, with both casual conversation and structured interview questions. You should properly research the job description and the company as well as consider how your experience could help the company before going on the interview. However, group interviews call for additional skills to make a great impression. Following are 10 strategies impress everyone in a group interview. Politely introduce yourself to the other candidates before the interview starts as you will be observed as soon as you arrive. It is essential to be seen as an active member instead of an observer. Contribute your ideas and views while also listening to the other candidates. Avoid coming across as aggressive, but appear confident. Do not interrupt other candidates by dominating the conversation. Give constructive feedback and accept criticism with grace. Acknowledge valuable participation from other candidates and give praise when possible. Keep away obvious power conflicts because these will make you appear unprofessional and uncooperative. You need to stay calm even under pressure. Know your body language. The interviewer will observe your body language. It is important to make sure that you are sending the right non-verbal message through your body language. Since there are many candidates and they are trying to participate, someone may make your point first. If this happens, immediately think of a statement that complements their point. This will demonstrate that you are an active listener and quick to think on your feet. Prepare a few meaningful questions to ask. At some point, you will be given an opportunity to ask questions. Having a list of some insightful questions is an amazing chance to stand out from the other candidates. Before your interview, make sure to perform background research on the company to be remembered as a prepared and a well-informed job candidate. 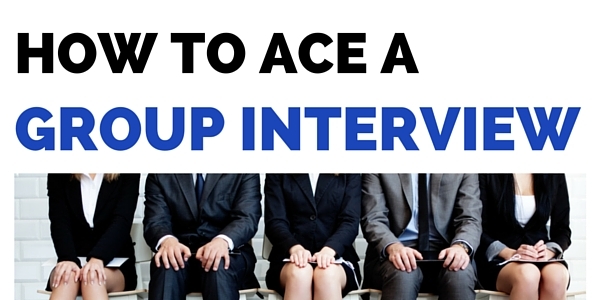 Follow all the above mentioned tips and your group interview experience will be a positive one. You will stand out as a competent, confident and mature candidate. What Types of Questions are Asked at a Group Interview? Introductions: Usually, opening questions focus on general information about you. When the interviewer asks questions about you, spend 2-3 minutes describing your experience and skills. Explain how well you get along with others and that you are a hard worker. Providing solid examples from your past work experiences would be best. Company Information: Research thoroughly and gather as much information as you can from online sources about current projects in which the company is currently working on. Moreover, check the official website of the company to see if there is any important information about the people conducting the interview. The panel may ask you to give them solid reasons for why they should hire you. The best way to answer this question is to let them know what you did in your past jobs and how that is related to the requirements for this job. Salary: Unless the interviewer brings up salary, do not speak of it. Generally speaking, salary will be discussed on an individual level and is never the focus of a group interview. Team Work: Because employers arrange group interviews to see how you handle yourself amongst a group of people, they may ask you about your team-management skills. This would be a good opportunity to describe extracurricular activities or examples where you successfully worked with a team. Group interviews are a time-saving way for a hiring company to determine the leadership and teamwork skills of multiple candidates simultaneously. Generally, the format of such interviews includes group discussions, scenarios that include problem-solving and role-playing. The solution to succeeding in this kind of atmosphere is to develop a memorable, positive impression, while remaining professional, friendly, with a demonstrated will to help others. This article only scratches the surface of group interviews. Though this article will give you great insight into the inner workings of a group interview, it only scratches the surface. There is so much more you might need to know, like all of the positive traits employers seek in candidates, detailed group interview preparation steps, do’s and dont’s, in-depth strategies, and how group interview exercises work and what they consist of. 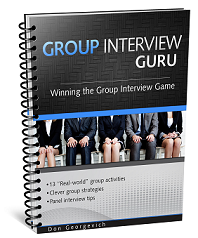 Until recently, this information was not available, but fortunately, there is a new book called Group Interview Guru that breaks down the group interview process and shows you, step-by-step, how to prepare and win the group interview game. 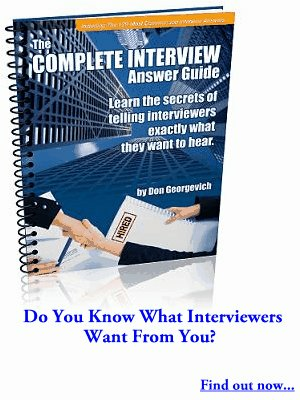 Group Interview Guru was written by interview expert Don Georgevich. With Group Interview Guru in hand, you’ll be well prepared for your next interview. How to ACE a Group Initerview - Download Now! Thank you very much for your wonderful knowledge.i succeeded with the group interview and now I am working. you’re welcome. I’m glad I was able to help you. I really appreciate the information. After being with my company for over 30 years and proven to be an outstanding employee, the company moved to posting for jobs versus performance based for promotions. I haven’t interviewed in 30 years, yet I’m expected to now interview to a panel of directors. Very frustrating. Panel interviews can be tricky. have you looked at the complete interview answer guide for help? Thank you sir,these useful tips polish every candidate with confidence. Thank you, Don It’s really great article . Really enjoyed your presentation. All the important points are true and useful and indeed great points to remember given those situations. Again, thank you for that free gift. That was thoughtful of you. GOOD, I HAVE BEEN RECEIVING AND READING MOST OF YOUR BOOKS AND OTHER MATERIALS YOU DO FOR JOB SEEKERS ALL OVER THE WORLD. GOD BLESS YOU FOR YOUR AND GAINFUL IDEAS. Very helpful and perfect timing as I’m having one coming up. Wow that’s important information there,and also very true. Wow that’s important information there,and also very true.thank you for the book sir. This article is great and I’m 100% sure that with your assistance, my next interview will be successful. I really appreciate your hard work , thank you sooo much about the imprtant information it will help for my next interview . I am not currently looking for a job, however, I took some time to read your article on group interviews. I must say it is very interesting and will be very helpful if I should have to do one. Thank you for sharing this information and God bless you as you continue to help others through your knowledge. Very useful – clear thinking on what you might face and how to prepare mentally for what is coming. Interviews can vary so widely, but group interviews are an unknown quantity as you have a competitor possibly / or future assistant plus the world is a small place and you may meet again. So getting you and your point over is key. thanks Walter. glad you found this helpful. I appreciate your continued help on my interview preparations. This information is very helpful and I thanks you for that. I always look foreword to Don’s emails, and they never fail to disappoint me. His advice is first class, thank you Don. I do need some help/professional advice on me CV, it is three pages too long and I am unsure what to leave out or more importantly, keep in. I may have missed one of Don’s emails with this advice in it. If so, is there any way of getting either help with my CV or a copy of the CV email from Don? Thank you for all the help and great advice Don. Thanks Amanda. I’m glad to be here for you. I’m very pleased to have this massage for interview from you I really thanks you a lot .I will continue keep it up for my concerns. Thank you so much for your help..I was made redundant two years ago after 35yrs working my way through one company. Such a daunting experience as I had grown up with this company. Not sure I should be saying this but I have had 6 jobs in the last two years..all with your help ! Some of the positions were contract, others were jobs I just was not comfortable in..with the confidence and knowledge I gained from your manuals & videos I felt compelled to keep going till I found my new home. Great article but its needs more real examples. Thank you so much for your help….. Thanks a lot Don.Excellent job. I will need in the future for myself and my children. currently I am in well paid job. I really enjoy reading emails. Bro God bless you. I appreciate your continued help on my interview preparations. This information is very helpful for me in the next interview. I really appreciate the information. May GOD bless you as you continue to help others. I really appreciate this article, I hope it would help in my next interview. Greetings Sir, it’s really helpful and great work nd I am so thankful to you. Thanks for the article. Only one question though, how do you handle a panel interview with only the panel and just yourself? I’ve had several panel interviews with 5 panelist and just myself that lasted 2 hours. I thought that things went well, but I didn’t get the job. We were serious then we were laughing and we all got along well. I still didn’t get the job, any ideas on why? Thanks….. Thanks so much for sharing with us your knowledge, experience and wisdom not only on HOW TO ACE A GROUP INTERVIEW but many other topics. You are a TRUE MENTOR to those hunting for new jobs in all fields of which am one of them. I will apply your wisdom in my search for job and I am confident that the goal will be reached. Thank you Don for this free gift. It is most useful and I will certainly follow your tips when I next apply for a position. Your site is surely attractive and extremely interesting. I am very grateful about the kind of coach you are. Actually,i was surfing the net on information for my career and come across your page,which made me fell in love with. I am currently working as a receptionist but i believe the information contained here at your site are truly awesome,and i would not hesitate to introduce it to anyone who needed help from you. Keep up the good work Don,GOD bless you. You are very helpful and thank you for your support. Wow it was of great help when I refer to your article. Actually I got the job! Thank you so much. Thank you so much sir, Good information sir. hi don,i would like to thank u for the help you always deliver to various job sinkers its really a great job and wish to help me at a barrister interview at any hotel or cafe. thank u very much for y’re cooperation. Thank you for sharing these information. Since I am currently looking for a job now, its gives me time to read and be ready for the my next interview. God Bless You. Much Appreciation Sir for the article. It has broadened the horizon of my thinking in regards to group interview. stay Blessed. Thank you very much for these invaluble tips ..I’ll treasure it . Thanks for the guidance to ace my interview. It has given me lots of stuff in my any upcoming interviews. Thank you Don for all the knowledge you share with us, the people who are trying to Find a new job. The tips of your book ‘The Complete Interview Answer Guide’ are invaluable,I helped me five years ago to be hired by a very good and reputable company. Now I applied for an even better position with another company and I am confident that it will help me to successfully pass this interview as well. This other tips for the group interview are awesome , I really appreciated. At least it will add up with the little information i have on how to ace panel/group interviews. I am very grateful for all if your emails. They have helped me in every aspect of my job hunting.